For the first time since Regan, we have a President who loves America, has a true heart for the people and fights for us true Americans. Unfortunately, not everybody feels that way. What we are having in America is people who say they are Republican and are running as Republican when actually they are going to think and agree with the Democrats-they are fooling the people by doing this and we are going to get more and more Republican who will actually be there for the Democrats really hurting the Republican Party!! The closer President Trump gets to drain the swamp, the more these corrupt politicians try to get rid of him. It started with John McCain who turned his back to conservatives when he provided the decisive vote to defeat the Senate’s “skinny” repeal bill. Continued with Senator Jeff Flake who attacked Trump and Trump supporters by calling them racist, and with Tillis wants to expand the Russia investigation.These three self-serving men are so in love with themselves, and they are destroying America. But, Laura Ingraham is back again. 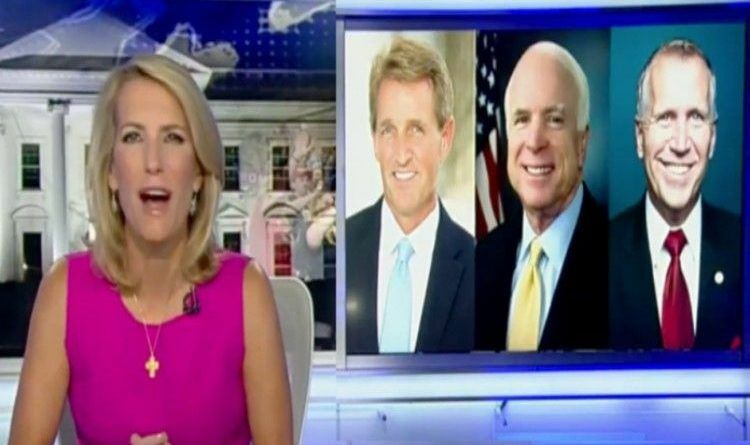 She appeared as guest hosting on Tucker Carlson last night and exposed these Senators’ for what they really are. Referring to these three senators she said: “What unites all of them is their sad and rather pathetic fear and loading of President so they want you so saturated in this endless and mindless Russia story deal.” She pointed out that after Thom Tillis bragged about giving Mueller more power for the Russia investigation, his approval rating plummeted to 28%. But she didn’t stop there. After she embarrassed these three Republican Senators she exposes the real reason they don’t like Trump. They have betrayed America. It is unamerican to not accept an election and the democracy. The people will never forget this is their legacy!